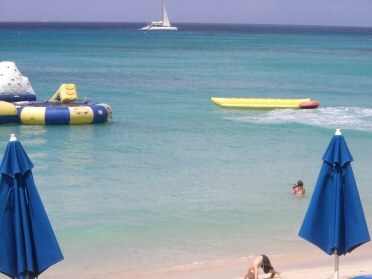 Mullins Beach has a fantastic beach bar and lots of water activities. Mullins Beach is located on Mullins Bay on the West Coast in the Parish of St. Peter Barbados, it's an amazingly wide beach of powdery fine white sand. It's very easy to get to if you're using the bus, if you're going from Bridgetown get the Speightstown bus it goes along the West Coast road which is a nice ride as it's a tour in itself and it only costs $1.50 BDS. Tell the driver you want to get off at Mullins beach and you shouldn't have any trouble, it's right across the road. If your driving its even easier to get to and there's parking right across the street. 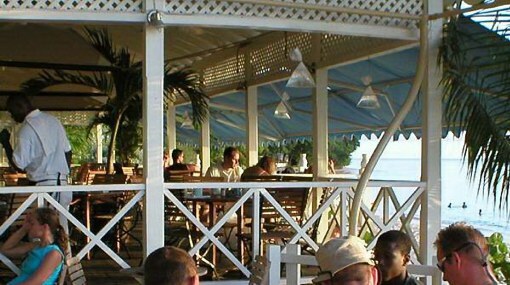 Mannie's Suga Suga Beach Bar one of the most popular beach bars in Barbados is located on Mullins beach. Rent a beach chair because it's the kind of place where you'll want to spend the entire day. 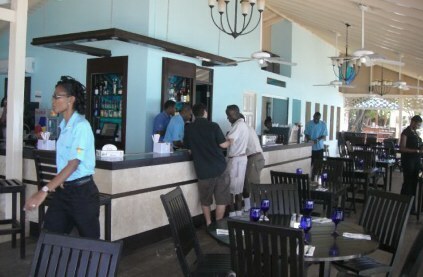 If you get hungry or thirsty they have reasonably priced food and drinks and if you're on the beach sitting under an umbrella you don't even have to get up just put up a flag and what they call a pamper person (a waiter) will get your order and bring your food or drink to you. That service is nice but after a few hours of sun and sea and getting cooked it's nice to go into the shade of the beach bar. There are all kinds of water sports available at a cost of course. The whole family can have a great time on this beach there's, jet skiing, rubber tubes pulled by motor boat, water skiing, glass bottom boat rides or just float around in the water. On Mondays and Wednesday nights there is live entertainment. On Monday night there is a dinner and cabaret show with good music and the performers are dressed in beautiful costumes and the dancing is fantastic. After the show there's recorded music and dancing till the wee hours. There's a $6.00 Bds per person surcharge for the show. Wednesday nights are for the jazz lovers, enjoy a great dinner while listening to some of the coolest jazz on Barbados Island.